Polypharmacy and potentially inappropriate medications (PIMs) are increasingly common and associated with adverse health effects. However, post-graduate education in polypharmacy and complex medication management for older adults remain limited. The Initiative to Minimize Pharmaceutical Risk in Older Veterans (IMPROVE) polypharmacy clinic was created to provide a platform for teaching internal medicine (IM) and nurse practitioner (NP) residents about outpatient medication management and deprescribing for older adults. We aimed to assess residents’ knowledge of polypharmacy and perceptions of this interprofessional education intervention. A prospective cohort study with an internal comparison group. IM residents and NP residents; Veterans ≥ 65 years and taking ≥ 10 medications. IMPROVE consists of a pre-clinic conference, shared medical appointment, individual appointment, and interprofessional precepting model. We assessed residents’ performance on a pre-post knowledge test, residents’ qualitative assessment of the educational impact of IMPROVE, and the number and type of medications discontinued or decreased. The IMPROVE intervention group (n = 18) had a significantly greater improvement in test scores than the control group (n = 18) (14% ± 15% versus − 1.3% ± 16%) over a period of 6 months (Wilcoxon rank sum, p = 0.019). In focus groups, residents (n = 17) reported perceived improvements in knowledge and skills, noting that the experience changed their practice in other clinical settings. In addition, residents valued the unique interprofessional experience. Veterans (n = 71) had a median of 15 medications (IQR 12–19), and a median of 2 medications (IQR 1–3) was discontinued. Vitamins, supplements, and cardiovascular medications were the most commonly discontinued medications, and cardiovascular medications were the most commonly decreased in dose or frequency. 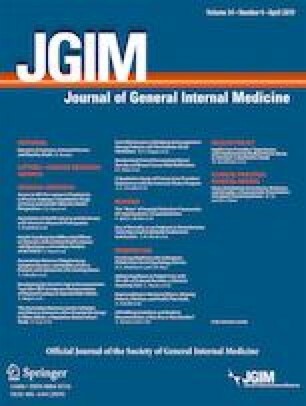 Overall, IMPROVE is an effective model of post-graduate primary care training in complex medication management and deprescribing that improves residents’ knowledge and skills, and is perceived by residents to influence their practice outside the program. 2016 Society of General Internal Medicine Annual Meeting (Poster Presentation), 2017 American Geriatrics Society Annual Meeting (Oral Presentation). The authors would like to acknowledge and thank Elizabeth Armstrong, Ph.D. and the Harvard Macy Institute, as well as Lauretta Grau, PhD, for her skillful assistance with the coding of manuscripts, and Destiny Printz, for her skillful conducting of focus group interviews. This work was supported in part by the Veteran Affairs Office of Academic Affiliations (COEPCE), VA Connecticut Healthcare System, John A. Hartford Foundation (Center of Excellence Geriatric Scholar Award), the Yale Claude D. Pepper Older Americans Independence Center at Yale University School of Medicine (P30AG021342 NIH/NIA), the National Institute of Mental Health (5R25MH071584-07), and an award from Health Resources and Services Administration Geriatric Workforce Enhancement Program to Yale University School of Medicine (U1QHP28745). This study was approved by the Human Subjects Committee at Veterans Affairs Connecticut. Waiver of informed consent was granted and no participants received payment. Dr. Jeffery is a consultant for CVS Caremark. All remaining authors declare that they do not have a conflict of interest. This material is the result of work supported with resources and the use of facilities at the VA Connecticut. The contents do not represent the views of the U.S. Department of Veterans Affairs or the United States Government. ACGME, ABIM. The internal medicine subspecialty milestones project. 2014; https://www.americangeriatrics.org/sites/default/files/inline-files/Internal_Medicine_Subspecialty_Milestones.pdf. Accessed 12/21/2018. Mecca M, Niehoff K, Grammas M. Medication Review Worksheet 2015. 2015. https://pogoe.org/productid/21872. Accessed 12/21/2018. McAuley D. Multiple Creatinine Clearance Methods. https://globalrph.com/medcalcs/creatinine-clearance-multi-calc-2012-edition/, 2018. Accessed 12/21/2018. ASCVD Risk Estimator Plus. http://tools.acc.org/ASCVD-Risk-Estimator-Plus/#!/calculate/estimate/, 2018. Accessed 12/21/2018. Hwang C. CHA2DS2-VASc score for atrial fibrillation stroke risk. http://www.mdcalc.com/cha2ds2-vasc-score-for-atrial-fibrillation-stroke-risk/, 2015. Accessed 12/21/2018. Bleeding Risk in Atrial Fibrillation: HAS-BLED Score. https://qxmd.com/calculate/calculator_106/bleeding-risk-in-atrial-fibrillation-has-bled-score, 2018. Accessed 12/21/2018. Mecca M, Niehoff K. IMPROVE Polypharmacy Project. 2017; http://improvepolypharmacy.yale.edu/. Accessed 12/21/2018. Thomas J, Mecca M, Niehoff K, et al. Development and validation of a polypharmacy knowledge assessment instrument. Am J Pharm Educ. 2017. http://www.ajpe.org/doi/pdf/10.5688/ajpe6435. Accessed 12/21/2018.